Crazy Spring! 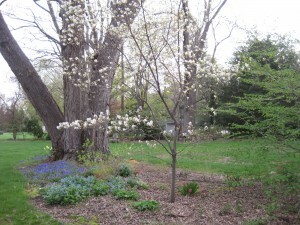 – Gilson Gardens, Inc. Things are going crazy! The weather is great! Our lot is full of cars! Passport2Plants is in full swing! WKKY was broadcasting from our parking lot this morning and I had to go out and talk with the DJ, on-the-air. That was not easy for me, but I got through it. 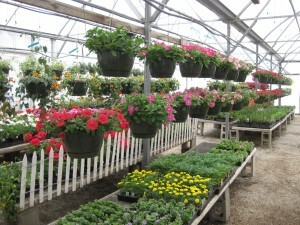 We have plants coming up from our own greenhouses and plants arriving from suppliers like Piazzas and Schusters. Yesterday we had no water pressure and it caused some tense conversations with our nursery people. Today it’s better and all the greenhouse ladies are helping us get set up. Here’s an awful picture of me that my husband took today. He specializes in awful pictures of me. Behind me is the tent with our 4H friends! 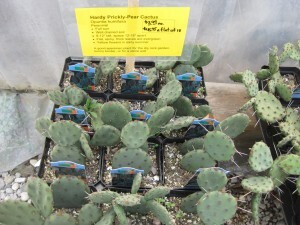 This is what I felt like this morning when I came in…a prickly pear cactus. By the way…where else can you buy hardy prickly pear cactus for $3.99? 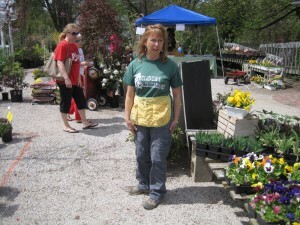 We have a new worker in our Garden Center, Paula, and it’s great getting to know her. She’s a go-getter. Her day-job is with Progressive Insurance. Pam Jenkins, who has been with us part-time for several years, just got our garden center Facebook page converted to a ‘wholesale account’, which we’ve been trying to do for a while. She’s taking a class in photography at Lakeland and is updating our page with photos. She also master-minds many of our displays, like the purple bedsprings in our greenhouse that the Wholesale Ladies find so objectionable! Ken is back to help out on weekends. His day-job is branch-manager of a local bank. Pam England is back. She works at Molinari’s and used to work at Lantern Court at The Holden Arboretum. We have a great crew this year. I checked in with our youngest son on Thursday, Michael, and he was at a conference in San Diego! Our oldest son, Matthew, just got back from Salt Lake City…and before that…Japan! All work-related. It’s good to know The Boys are busy and doing well, even though we don’t see them much at this time of year. 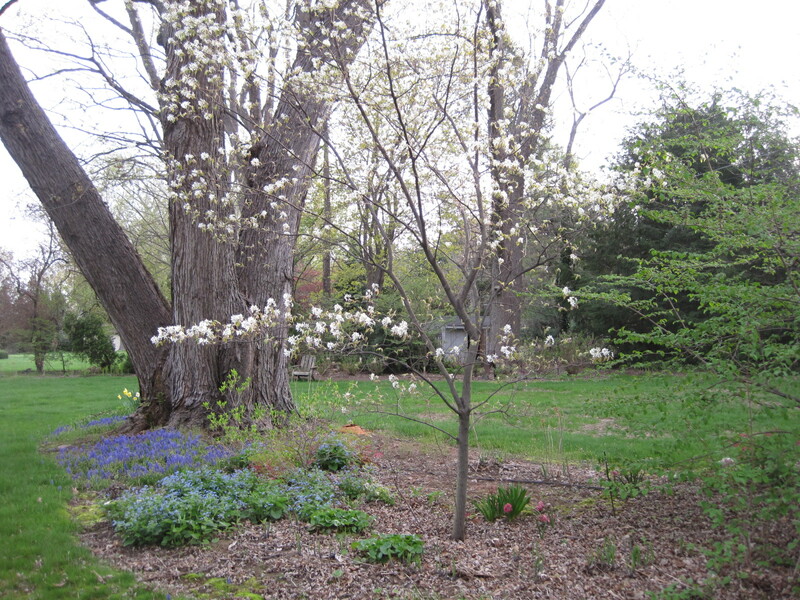 Below is a photo of the Amelanchier (Serviceberry) in our back yard, one of my favorite trees, taken yesterday. The berries will appear later…they’re very sweet…but the birds usually get them before we do!